Android Nougat included a feature that made it significantly easier for users to switch between recent apps, giving them the ability to quickly go to and fro like never before. This relatively unknown feature has carried over to the Galaxy S8, and it's sure to make multitasking on Samsung's flagship a whole lot more convenient. There's more to multitasking than using two apps side by side, as there are plenty of times where it would be easier to just flip back and forth between a set of apps to glance at pertinent information. Well, that's exactly what one gesture will help with, so here's a quick tip on how to use this nifty feature on your Galaxy S8 or S8+. If you ever find yourself needing to switch back and forth between apps — perhaps to check your calendar while planning a night out with friends via group chat — simply double tap your recent apps button. You'll instantly be taken to the last app you were using, where you can double tap again to head back to the first app. And there you have it! With this little feature, you'll never have to fumble around within your phone's system when you want to take a quick peek at a recent app. 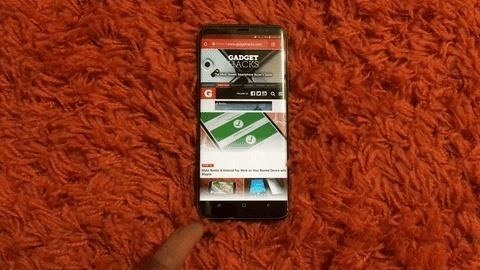 How do you like multitasking with the S8 or S8+ so far? Share your opinions or any relevant tips you may have by dropping a comment in the section below.